You can throw any party on a budget. The key to saving money is planning ahead. This will give you time to research options and spend your money wisely. 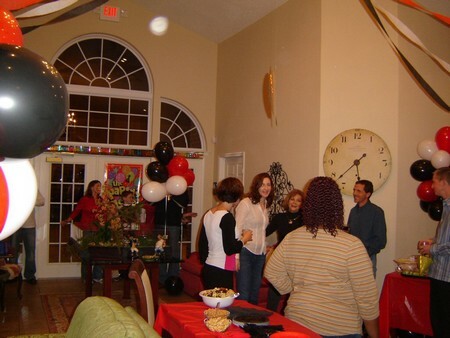 Surprise parties are meant to be family oriented and a happy affair. Extravagance is not a requisite. Create your guest list. Doing this will let you know exactly how many people will be attending the surprise event. Once the number of people have been determined, then if may be clearer how to spend your limited funds. Choose where you want to have your surprise party. Choosing to host the event at your home will eliminate the expense of having an outside venue. If your guest list is between 20-40 people you can have the event at your home or even at a restaurant. Call around to restaurants and see how much it would cost to rent a private room. Some restaurants offer these private rooms for free since they add gratuity to the bill of parties over a certain number. Confirm your room with the same person you booked the space from. Send out invitations three weeks before the event is scheduled to happen. If the age group of your guests is 40 or older, you should include a phone number so they can RSVP. You can find cheap fill in the blank invitations at discount stores, or you can make your invitations using a computer to keep costs down. For guests under 40 you can send out e-vites. Decide on the menu you want to serve. If you choose to have the party at your home choose to serve cocktails and light food items. Vegetable trays, chicken bites and cupcakes are all good options. Be careful on how much you spend on alcohol. You don’t want to serve too much alcohol because your guests will have to drive. Also, offer non alcoholic drinks for those people who do not indulge. Create the music you will play at the event. Download songs on your mp3 player and set it up with speakers. Let the music shuffle while playing. You will not need to spend money on a DJ is you opt for this. If you are having the party in a restaurant, you can still opt to use your mp3 for music. You can ask the manager to turn off the sound to the private room. Don’t forget the event is supposed to be a surprise. Distract a guest of honor. This way you can ensure the guest of honor doesn’t catch wind of what is going on before it is time.